Growing up, I don’t think my Father ever replaced his grill brush. We always had a cheap propane grill, and he always used the same brush. His was old and caked in so much grease and sauce that the bristles were completely covered and there were grooves in the grease/sauce mixture from cleaning the grill grates. I asked him once why he never bothered to replace it? He told me he was planning to get a new grill in the spring, and the stores usually give out a new cleaning brush with the grill. In hindsight, I think he was just trying to get me to drop the subject, because I’ve never seen a grill come with a free grill brush – especially not a cheap, $100 grill from the hardware store. 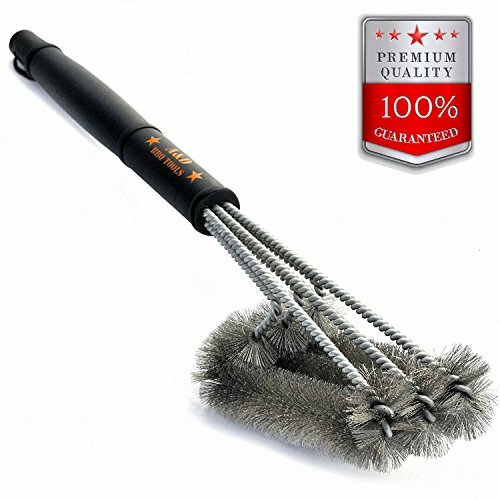 In this article, we’re going to cover my recommendations of what to look for in a grill brush, and take a closer look at a few below to help you in your search for the best grill brush for your type of grill. There are many important reasons to clean your grill, not least because grease and oil can turn rancid, if left on your grill grate will impart a bad taste on your food and could even result in flare ups and a grill fire. When you’re done cooking, you will probably have a build-up of black crust. This is carbon that has burned onto your grill grate, caused by a combination of fat and meat that stuck to the grill, and barbecue sauce. It tastes like burnt toast and you don’t want it on your food. If the fear of rancid grease and the flavor of burnt toast on your food doesn’t make you want to clean your grill, just remember: A dirty grill can attract insects. Would you like a side of ants to go with your burger and weenies? I didn’t think so. The below video by UltimatePatio.com does a great job of describing how to properly clean your grill grates. It’s best to clean your grill while the grates are hot. Whether you’ve just finished cooking, or are just starting, you should turn your burners on high and close the lid for 10 – 15 minutes. This way, a lot of leftover grease will burn off, and what is left will harden and turn into carbon. This carbon will be much easier to clean off with a brush. Once you have a hot grill, clean your grates by using a brush with strong bristles. The act of cleaning is pretty self-explanatory; simply apply force with your brush to the grill to remove any leftover carbon and grease. Most grills have either a stainless steel or cast iron grate, and truthfully you can get away with any type of brush with these grates. If you have a grate that is coated in either porcelain or enamel you’re going to want a gentle metal, like brass, to not chip your coating. If your coating starts to chip, you’re going to start seeing it come off on your cooked food – which is just gross – as well as your grates losing their ‘non-stick properties’ and just looking a bit unsightly, pock marked and not in top shape. This may seem obvious, but I’m constantly surprised by the number I see with short handles – i.e. less than 6 inches. Most grills come with hooks on so you can hang your brush and other utensils. So either a sturdy leather string or metal loop to hang yours on should be a must. 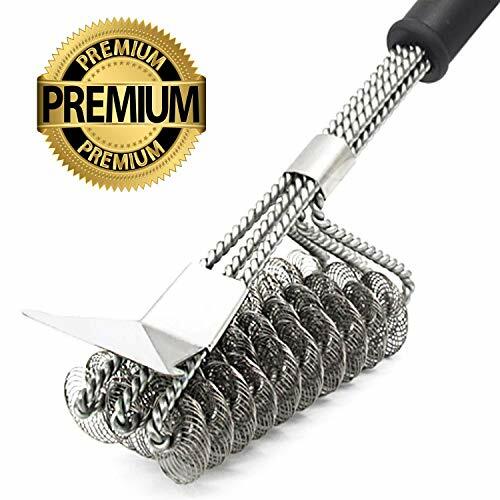 It’s been reported in the media lately that many people are having to be hospitalized due to ingesting metal bristles left on their grill from their brushes. Obviously, you don’t want that to happen to you or your guests. So you should aim to find one with very sturdy bristles that will not easily come out. Regardless of which you buy, if it has bristles, you should make sure you have a close look at your grill grate before you cook on it to inspect for loose bristles. We all forget to clean our grates after use occasionally…Don’t we? Well, I do. When this happens, you can end up with a really solid, hard to remove crust on your grates that a brush is just not the right tool for. This is when you need a scraper. A scraper is just as it sounds: It’s a solid tool, sometimes sharp, sometimes curved to fit around individual bars of your grate, that you can use to scrape away very hard baked on residue that a brush alone isn’t able to tackle. Many brushes on the market today have a built in scraper, and for not much extra cost. So it’s wise to look for a brush that has a scraper included. Trust me, you will find it useful. Many grill brushes have plastic handles. While that is all fine and good, many brushes also have plastic that runs right down to the bottom of the brush where the bristles are attached that gets very close to the heat. The downside to this is obvious: plastic melts. Even if you’re careful, you can still accidentally touch the hot grate with the plastic and have some melt off. The last thing you want to do is get melted plastic on your burger! As with many products these days, there are lots of unnecessary gimmicks when it comes to grill brushes. Most gimmicky models are poorly made and should be avoided. I’ve seen everything from “robot grill cleaners” to plastic brushes that have a squirt bottle attached to them (water makes the bristles rust, plastic melts, and the water inside the brush can freeze in the winter). Trust me, if it seems like it’s a hokey gimmick, avoid it. The only ‘extra’ we can recommend is a built-in scraper. So let’s take a look at some models with built in scrapers first. Many times you’ll find an incredibly hard, baked-on crust on your grate when you go to cook. It can be so hard in fact, that a standard brush may fail to remove it. This is when you’ll want a scraper. With a scraper, you can forcefully remove the worst of the baked on food with ease, before then using your brush to finish the job. 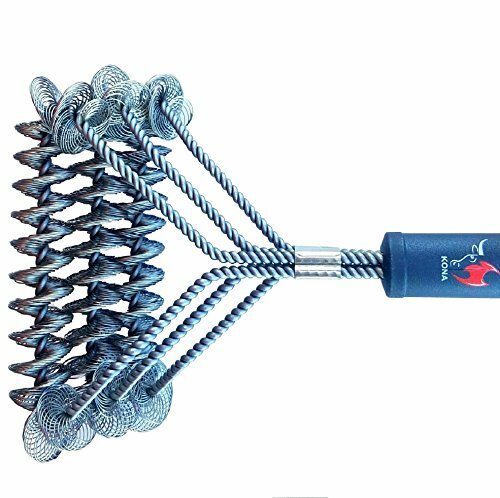 Following are 4 great grill brushes with built in scrapers that we’re happy to recommend. This is a real high quality, premium product, made from durable materials, designed to last – and even has a replaceable head to keep costs down when the bristles are worn and need replacing. It is a lifetime guaranteed, stainless steel handled brush, with a contoured grip for comfort during use. The main selling point of this brush is it’s patented bi-directional bristle brush head, that has two sets of bristles arranged in a perpendicular design, so as you stroke across the grill it cleans in 2 directions at the same time, potentially cutting out half the required work. For those who fear bristles working lose and getting stuck to the grates, they are very tightly bound and rarely come loose (though of course, always inspect your grates before cooking!). The handle is 18 inches, so keeps your hands safely away from the hot grates, and has a built-in bottle opener at the end which is a nice touch. Finally, the tip of the brush head is a scraper that is very effective at removing hard baked on residues. This brush is certainly one worth adding to your shortlist! 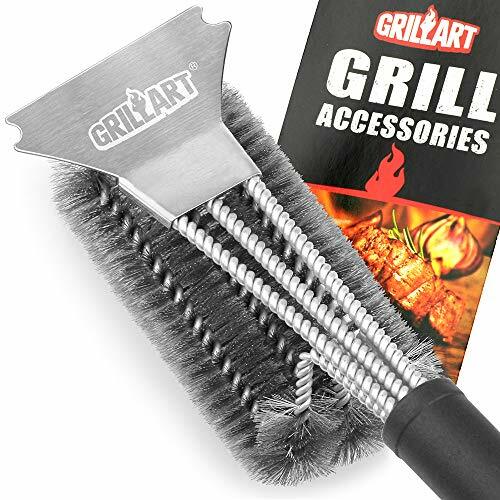 The Grillart grill brush and scraper is an incredibly popular, best selling, very highly rated and well-reviewed cleaning tool that gets results – we’re happy to recommend it. Made from stainless steel and with a lifetime money back guarantee, it is rust proof, built to last and the manufacturer is happy to back up their claims of durability. The three brush, 360-degree design affords greater cleaning power with every stroke, getting right onto the sides and even underneath every bar of your grate with each stroke. It’s claimed to clean your grill five times faster…we’re not sure about that, but it will undoubtedly be more effective and efficient than the majority of its competitors. The non-slip handle is 18 inches long, and the head is offset at an angle. These three features mean easy cleaning while keeping your hands well away from the hot surface. Also included on the top of the brush is a stainless steel scraper blade, with two notches on the sides, to scrape away hard baked on grime. The blade is excellent for scraping off food from the top of your grates, with the notches able to get right around every individual bar for thorough cleaning. This is a top of the range, highly effective tool, and we strongly recommend checking out the Amazon customer reviews to see just how much previous buyers love and recommend this tool. The main draw of this product is it’s ‘bristle free design.’ As discussed above, many are fearful of bristles coming loose from brushes, onto the grates and then into their food: Well this product has no bristles! Made from stainless steel, it’s going to stay rust free and due to its durable construction it should outlast many competing products. It comes with a think, comfortable handle making it easy to hold and use, and at 16 inches total length is long enough to keep your hands away from the hot grates while cleaning. 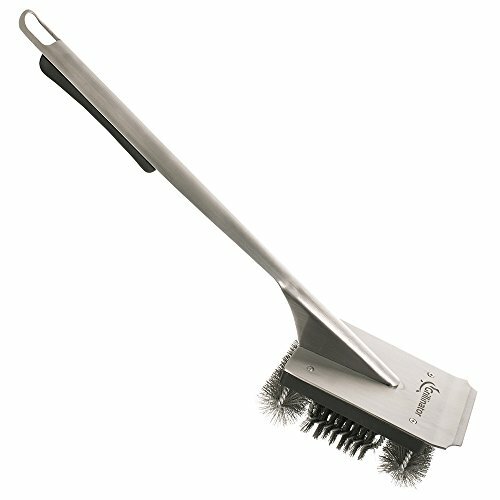 Similar to the GRILLART brush above, it has a ‘3 in one head’: A scraper to remove hard baked on residue, and the head can be used perpendicular to the grates to get all the surface crud off, and parallel to the grates to really get in between them for maximum dirt removal. Over recent years there’s been some quite some noise in the BBQ world about the dangers of bristles coming off grill brushes, sticking to grates, making their way into food and then into peoples stomachs, causing injury and ultimately surgery to remove them. With high end, well made, top-quality grill brushes it isn’t really a problem as the bristles do not come loose. But with cheaper, lower quality products this is certainly something to worry about. There are precautions you can take, such as wiping down your grates with an oil soaked kitchen towel after brushing, and then inspecting to mak sure no bristles are present, but the safest course of action is to do without bristles altogether. So for those of you who really must do without bristles on your grill brush, here are two of the best bristle free options we’re happy to recommend. 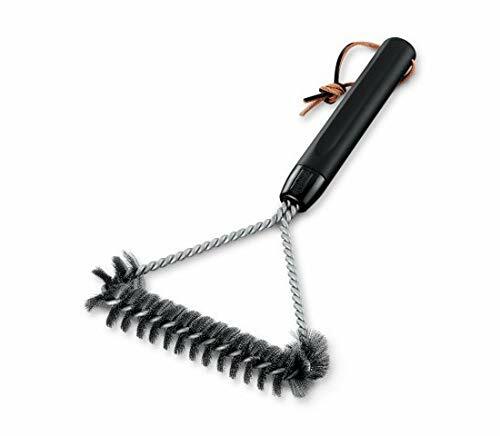 This brush is designed for people who are both worried about bristles getting stuck to their grill grates, and want a brush that is safe to use on their ceramic or porcelain coated grates. The Kona 360 clean does not feature any bristles. Instead, it features a continuous spiral of metal that can be used to get in and around the grill grates with ease. In addition, it features a long handle and leather strap. It’s also gentler than typical metal bristle brushes and can be comfortably used on ceramic or porcelain grill grates. One thing the manufacturer does not do is tell us what materials the brush is made from. If it is not made out of stainless steel, it may easily rust. 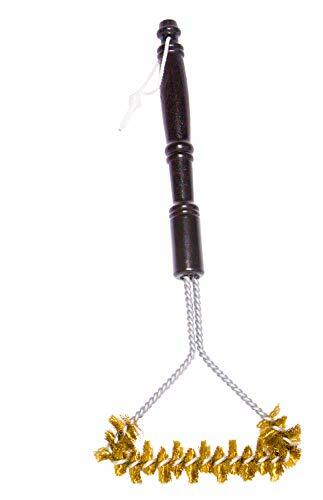 The Grill Grubber is a great tool for anyone concerned with wire bristles coming loose and sticking to the grate. This is because the Grill Grubber does not have any bristles! This brush features a long stiff handle and comes complete with a hook to easily hang it for storage. While most brushes feature fixed bristles that eventually wear down meaning the whole brush need to be replaced, the Grill Grubber comes with removable pads that can be replaced when they get too dirty. Given that this brush uses pads, It may not be as effective at getting to all sides of a grate as a bristle brush can. Personally, I still use a bristle brush on my grill grates. I just find they do a better job, are cheaper and tend to last longer. Or maybe I’m just stuck in my ways? 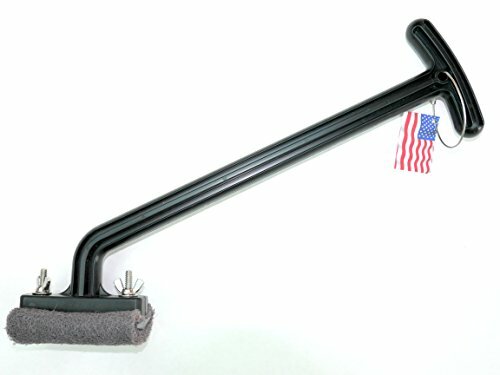 I want a long handle, so I don’t burn my hand. I want the closest part of the grill to be either wooden or metal, so not to melt onto the grate like plastic might. And finally, I want to be able to hang the brush up when not in use. Below is a selection of brushes that meet these requirements, and I give my thoughts on each. The A&D Tools 18” Grill Brush checks off all the boxes on my list when it comes to the must-haves; it comes with a long handle, the bristles are stiff and secure on the brush, the end of the handle is metal, and you’re able to hang it up. It also has a unique advantage of coming with three brush heads. This increases the surface area you can clean, so in theory, you will be able to clean your grill a little faster as well. There are a couple of detractors that I noticed: the leather strap that is supplied appears to be a little flimsy and may not last very long, and the handle is not galvanized or stainless steel and may rust when left outdoors. Weber have been in the grill business since George Stephen invented the iconic Weber Kettle in 1952, so it’s no surprise to see one of their grill brushes make this list. The 6494 12-Inch 3-Sided brush does indeed come with stiff, sturdy bristles, a handle that is sturdy and has metal at the end, and a hefty leather strap to hang the brush up with. The unique design of this brush allows the user to use three sides when cleaning, so the brush can be tilted and used to get into hard to reach angles. On the down-side, the handle is short. When they say 12 inches, they mean total length – not just the handle. So you may end up getting a little closer to the fire than you perhaps wanted to. I think this brush may best be used if you have a small travel grill and want to be able to easily pack up your brush to take with you. This brush is very similar in design as the Weber 6494 mentioned above and shares many of the same praises. It has sturdy bristles, has metal on the end of the brush, has a sturdy rope hook. It also has a neat triangle design so you can get into more crevices when cleaning. This brush also has the advantage of brass bristles, making it a gentler brush than most of the standard steel bristle models so would be great to use on grill grates with porcelain coating. In addition to getting a great brush, you also get a free download of the “Summer is BBQ Time” E-book with the purchase of this brush, featuring BBQ recipes, tips, and tricks. Just as it shares many of the praises of the Weber 6494, the BEST BBQ Brass Grill Brush also shares the biggest detractor, being somewhat short handled compared to others. This may result in burned arm hair but will be great for backing up and taking camping. Like any other piece of equipment, your grill must be maintained on a regular basis. By owning a quality grill brush, you’re able to regularly clean your grate surface and keep it free of rancid grease and built up carbon. While any of the models listed above would be a welcome addition to my deck, I would have to conclude that either the GRILLINATOR or the KONA 360 CLEAN are our most highly recommended and in our opinion, the best grill brushes in our roundup. The KONA 360 can be used on any grill grate surface with its bristle-free design meaning there’s zero chance of bristles becoming stuck to your grates and eventually ingested with your food. It also features a long/sturdy handle, and a robust metal hook to hang it up. The GRILLINATOR though just screams quality. It’s well thought out, efficient during use, has some cracking features, a lifetime guarantee, looks good and has an integrated scraper and bottle opener to boot. No matter what you pick, all these grill brushes will keep your grill spotless! I just read the Grill Brush review and appreciate you providing the information but I don’t see how a brush without a scraper end is worth the effort. Maybe next time you can include those in your review. Hi Darren, that’s a fair shout, I’ll add some in. I just saw a brush with four layers, wondering if that’ll work more efficiently or be harder to use cause it’s heavier. Do you have any suggestions whether it is a good choice? I couldn’t possibly say without seeing it, reading genuine user reviews and customer feedback etc. To be honest though, I wouldn’t worry about the weight of it because during use it will be resting mostly on the grates as you scrub, which will be taking most of the weight. So my advice: If none of the baove take your fancy for whatever reason(s), read the customer reviews of the 4-layer brush you are considering, to see what current owners say and then decide from there. Best of luck! Thank you so much. I’ll see then.